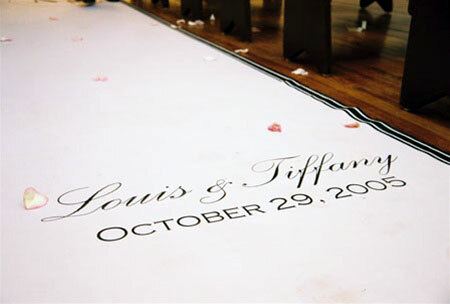 Hi - I was just wondering where I can order a personalized aisle runner with the wedding date and names inscribed. Is there anywhere in Canada that provides this service? Just want something different from the typical red carpet in the church..
A company in the US & in Ontario called "Aisles with Style" does custom made aisle runners, that don't slip and have a non slip backing. So go ahead and wear those Manolo's on your big day. Yippee! The best part is you can get you aisle runner customised. Not only do you get to pick the length and color you also get the option to put your name and or wedding date on it. What a great idea and so many options. Now you are wondering what am I going to do with it after the wedding? There is so many things you can do. Either, cut the portion with your name and use it as a mat in your home. What a great idea to welcome guests.You can frame it, which is the way I recently saw it displayed or you can just keep it. Maybe for your home on the deck or even in you foyer? I am sure there is many more things you can do with it and if you are creative. I am sure you can come up with lots of ways.